Welcome to the UPPER BODY BURN Series. These workouts are all about the arms, shoulders, chest, back and a bit of core! You will work them from all angles with lots of different overload techniques to really shape your upper body. Using your own body weight and other implements of torture you will see lots of unique combinations to keep your mind and body engaged. There is a lengthening stretch at the end of each workout. 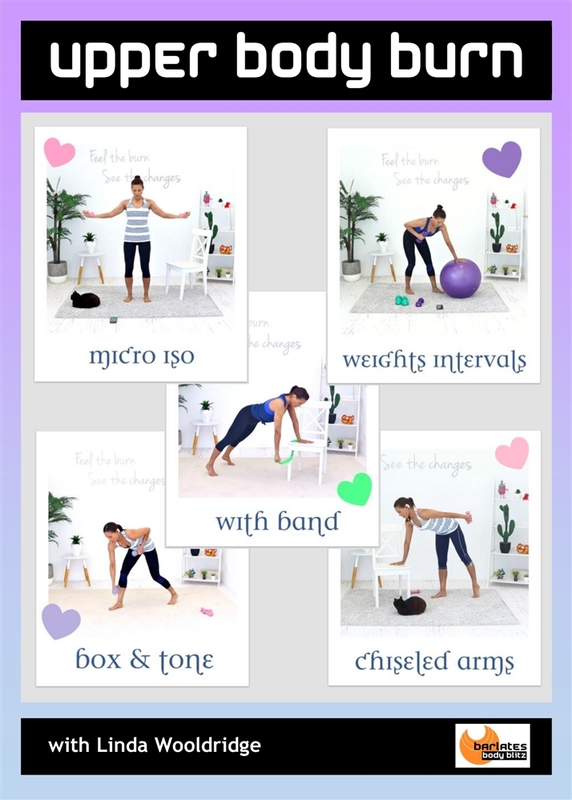 Micro Iso (30 mins): you will perform barre style exercises with high reps and light weights and then use isometric holds to really increase the burn. There are lots of fun combinations with some push-ups, triceps dips and back extensions thrown in for good measure. Weights Intervals (23 mins): is a timed workout with 60 second intervals of each exercise. There are 20 non-stop rounds. You will use slightly heavier weights with lots of combination exercises to burn out all your major and minor muscle groups. Band (29 mins): use a band and chair to target all your smaller, supporting muscle fibres. You will see some unique functional training moves and some more isolated exercises both on and off the chair. 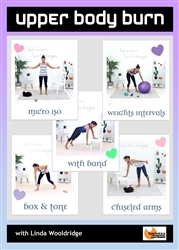 Chiseled Arms (28 mins): is a fast and efficient barre style arms workout that uses light hand weights and high repetitions to chisel a lean, defined upper body. You will start seated on the chair with some non-weighted arm exercises, then move on to some light weights arm combinations that also engage the core and lower body. Box & Tone (25 mins): a high energy cardio sculpt workout that uses light and slightly heavier weights to sculpt your muscles. There are fun boxing combinations and then slower sculpting segments using the heavier weights. You will sweat and burn with this challenging routine. 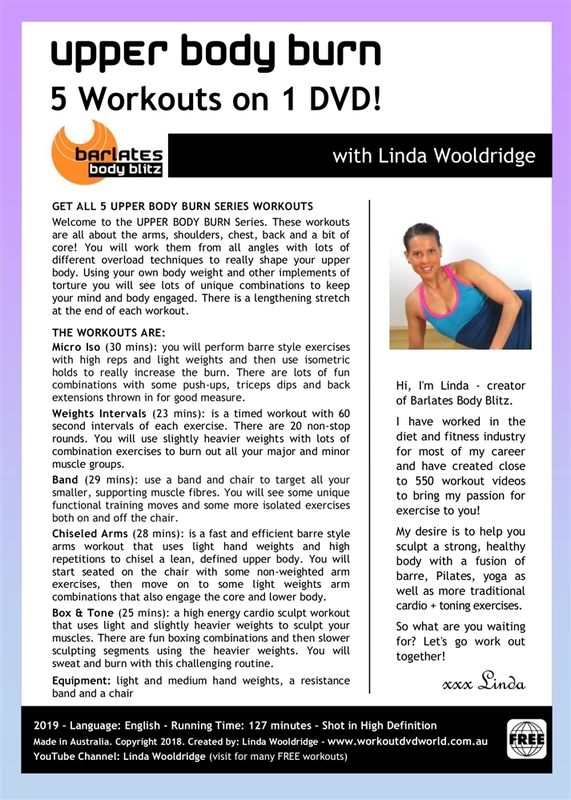 Hi, I'm Linda - creator of Barlates Body Blitz. I have worked in the diet and fitness industry for most of my career and have created close to 550 workout videos to bring my passion for exercise to you! My desire is to help you sculpt a strong, healthy body with a fusion of barre, Pilates, yoga as well as more traditional cardio + toning exercises.